With Autumn here and the winter months fast approaching, you'd think that working on our backyard would be the least of my worries right now. And sure, my boyfriend would probably be inclined to agree... but still, I'm not letting that deter me. Since moving in, we've started making our little yard feel like home (and if you didn't catch it already, there's a sneak peak of our outdoor space here). We've bought a load of plants and made it a little more of a green space. But I still feel like there's something missing. While it's maybe a little too small a space for something like a garden showpiece, I still feel like there's a lot to work with. 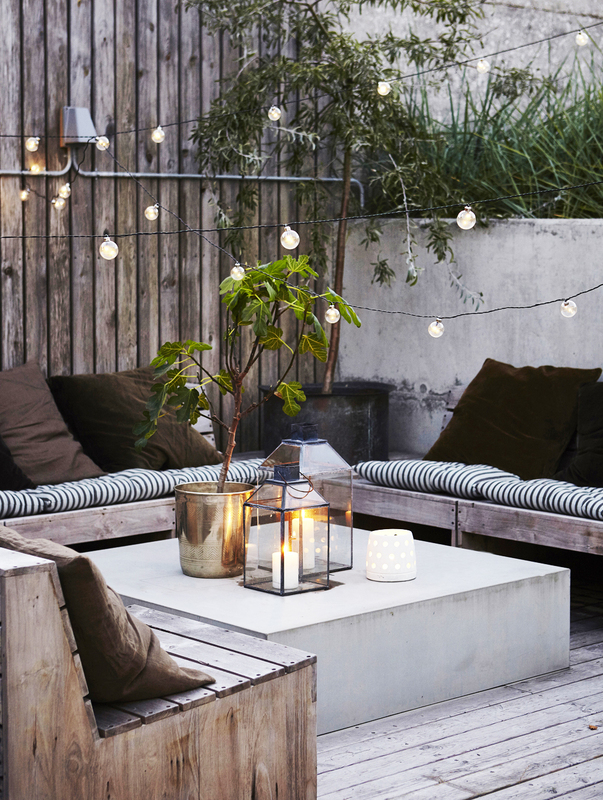 And with the dark nights creeping up, of course the first thing that sprung to mind was lighting and garden furniture! Despite my last post, we've still not gotten our act together with planning lighting. My heart is still set on a little combo of copper wire lighting across the wooden fence and festoon lighting draped across the washing line... but I thought I'd take to Pinterest for a few ideas of how to style the space and share my thoughts in case you're thinking about your own little yard! All of the images are via Pinterest.